Veterans, including some in San Diego, are criticizing Donald Trump while others come to his defense for remarks he made to a veterans group on the sensitive subject of PTSD and suicides among those with combat-related injuries. On Monday, the Republican presidential candidate addressed the Retired American Warriors PAC in Herndon, Virginia, where Marine Staff Sgt. Chad Robichaux asked whether Trump would support funding holistic approaches to helping veterans treat PTSD and other injuries sustained in combat. Trump gave a 285-word answer but the crux of his remarks was focused on these four lines: When you talk about the mental health problems, when people come back from war and combat and they see things that maybe a lot of the folks in this room have seen many times over and you’re strong and you can handle it. But a lot of people can’t handle it. And they see horror stories. They see events that you couldn’t see in a movie, nobody would believe it. Several news organizations ran headlines seizing on Trump’s “can’t handle it” quote, and on social media people alternately criticized Trump for his remarks or news outlets for omitting some context. Hillary Clinton also used the opportunity to criticize Trump's comments as "ignorant and harmful". In 2011, Mitt Romney suggested that veterans' health care should be privatized. He was criticized by the usual suspects on the left and by the Veterans of Foreign Wars (VFW). Then, last year's Veterans Administration (VA) scandal compelled the nation to notice the VA's brand of government-run medicine was far worse than previously imagined. For all the claims that veterans do not want privatized health care, Concerned Veterans for America and the Tarrance Group conducted a nationwide survey of over 1,000 veterans that suggested otherwise. The results show: - 88 percent of respondents agreed that eligible veterans should be given the choice to receive medical care from any source of their choice. - 95 percent said it was "extremely" or "very important" to have the option to seek the best possible care, even if that means receiving treatment outside of a VA facility. - 77 percent of veterans thought it was "extremely" or "very important" to give veterans more choices in their insurance products, even if those alternatives involved higher out-of-pocket costs like co-pays and deductibles. 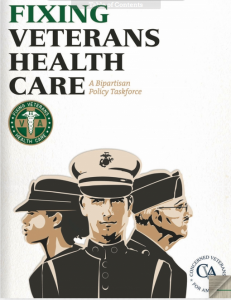 Today, Concerned Veterans for America is publishing the most comprehensive reform proposal in decades, and ensures veterans gain access to the same high-quality health care available to most Americans. The Veterans Independence Act seeks to address the same basic problems lawmakers faced when they tried to reform the VA in prior years. It strives to achieve deficit neutrality by including some co-pays and deductibles in the private coverage options and restructuring the VA hospital and clinical facilities. Is there a message for Obamacare from the VA scandal ?